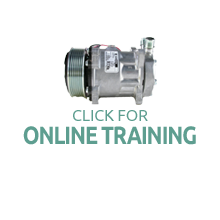 Sanden originally developed its first electric compressor in the mid-1990's for use on many pure electric driven vehicles. The original electric compressor design featured a semi-hermetic scroll compressor that was capable of cooling and acting as a heat pump. The original design is no longer available and has been phased out due to the lack of acceptance of most pure electric vehicles. The new design will have the drive electronics integrated into a single casing as opposed to the older generation which had a separate compressor and electronics housing. The integrated design will provide a smaller and lighter compressor solution. The inverter electronics will be cooled by the refrigerant gas of the A/C system unlike the previous generation that was water or air cooled. The upcoming design will use an improved, industry standard, communication signal that can be customized to meet the needs different vehicle applications. The latest generation of Sanden electric compressor will began production in April 2009. This new EC model is proprietary; however, Sanden intends to release a generic version that will be available to all customers. This page will be updated as soon as the generic model is available. No information about the new design can be released until the generic version is ready for introduction. Sanden has conducted research and development on compressors that use refrigerants other than R134a. The drive for an R134a replacement is primarily being directed by government regulations designed to decrease or eliminate the negative impact of refrigerants to the environment. We will continue to closely monitor government regulations globally and develop mobile HVAC products that meet or exceed these regulations. Sanden's commitment to environmental excellence remains as a cornerstone philosophy of our corporation.